Every time I go in a city from the former 'West Germany' - I write this a couple of hours before the National Day 'German Unity Day' - I cannot but express my admiration for the coherence of the architecture and a different mood and outlook of the people, proof of an easier way to move through life. From many points of view, I can understand better the East Germany, but will always feel on my own in the very well put together 'West'. I wanted to visit Bremen for a couple of months, but the last time when I left home with a notebook full of travel tips I ended up in Stralsund due to some time miscalculations. A nice discovery, Stralsund, after all. But this time, I was determined to reach my travel goal and I arrived at the MeinFernbus bus station 20 minutes earlier. A couple of hours later, I was finally walking the streets of Bremen the streets, starting by observing the architecture. As almost all important buildings have a lot of explanations in German and English, I spent a lot of time at the beginning of my journey reading and taking notes about the local histories. At the first time, I had the feeling of a déjà vu, comparing the city with Lübeck, except the smell of fresh marzipan on the streets that was missing, but once the exploration advanced, I realized that the comparison was only a reference point to put some order into the confusion of the mixed first impressions. I am trying as much as possible to avoid running first and foremost to the 'big city attractions', but as I did read the story of the 'Musicants' as a kid, I decided to be a representative of the mass tourism for a couple of minutes and walk firmly in the right direction to meet them shortly as soon as possible. They are hiding in a corner, but are visible enough to be seen by the big groups of tourists from all over the world . It may look empty around in my picture, but believe me, it is not easy to get a good spot of them, as everyone wants to be pictured in the front of them. I continue my 'normal' discovery with another big attractions of the city: the old and new Townhall and the statue of Roland, the last one announced on the highway as part of the UNESCO World Heritage. As expected, the whole area was very crowded. Similarly with many other historical German cities, a small square near the central area was taken by the flee market with fruits and vegetables and some local fast food temptations. If you really love architecture, leaving the central area will bring a lot of pleasant discoveries of the hungry eyes, as all the big banks in the neighbourhood are hosted in beautiful buildings overcharged by stone embroideries and historical silhouettes, perfectly integrated into the modern landscape. 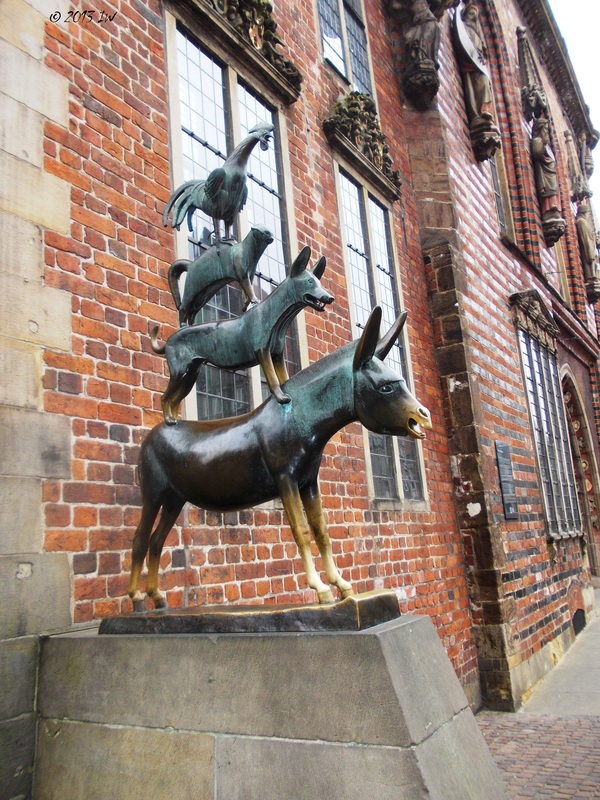 If it is something I will always remember about Bremen, is exactly that delicate balance of the architectural volumes. Like in a construction game, all the simple and equal pieces are put together to form creative spaces yet keeping the golden ratio. When I don't have too much time and I want to see as much as possible from a city, I may accept to embark for 30 minutes or one hour on a guided tour. I decided to do it this time, pleasantly impressed after I visited the big Information Office from the Kontorhaus am Markt, a former discount bank at the beginning of the 20th century turned into an elegant shopping center. For the 40 minute tour I was the only one interested and I felt like a special guest brought by the mini-train on a discovery mission of the city. 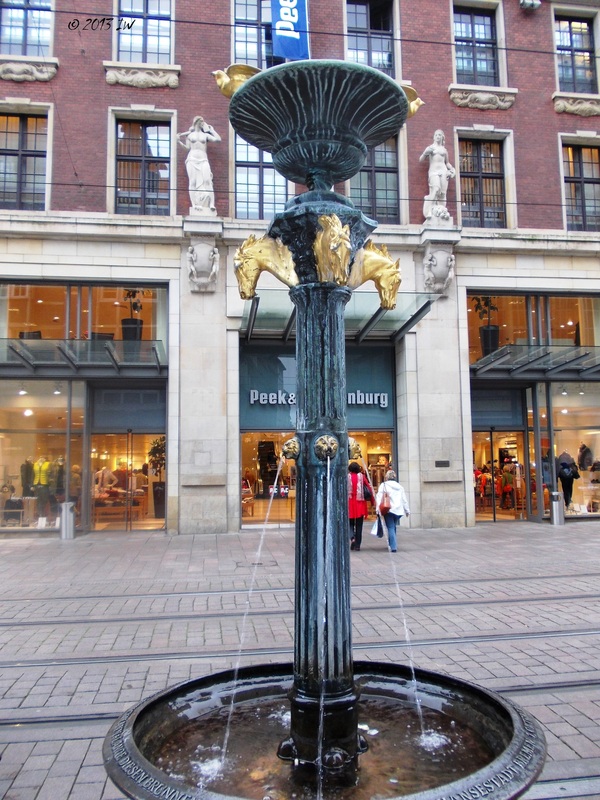 The explanations were simple, in German with practical details about the historical development of the city, its industry - and main brands as Beck's, Jacobs, Kellogg's or chocolat Hachez - and a little tour around the shores of the river Weser. Once back on the grounds, I went to see some of the spots I noticed during the trip. I started by entering through the golden gate of Paula Modersohn Becker Museum, a local artist from the beginning of the century, a close friend of Rainer Maria Rilke. Many paintings were beautiful, especially those from the beginning of her career, with many influences from Cézanne and Gaugain. 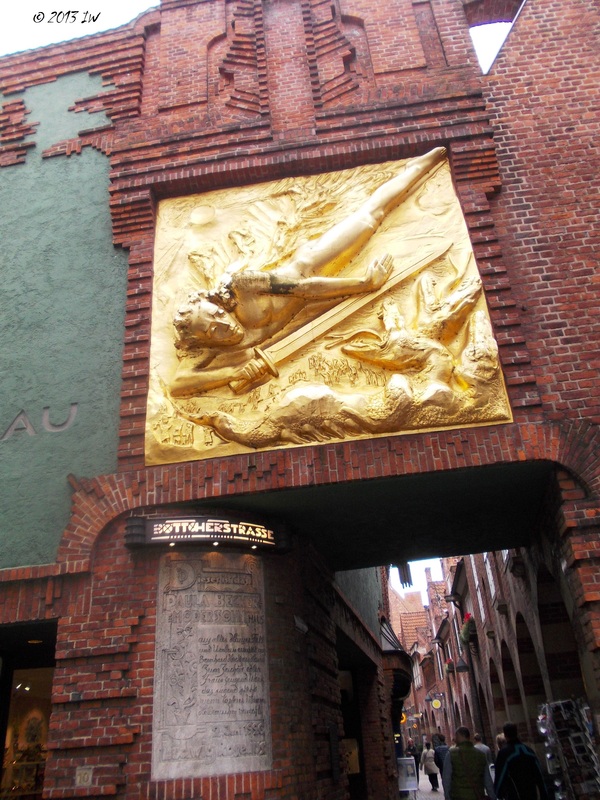 I continued with Ludwig Roselius Museum, situated in the same building, with more practical insights. Roselius was a local coffee businessmen that decided to invest in arts and culture. He contributed to the development of the Böttcherstraße in the 1920s. On an area of around 100 m. one can find the most unusual architecture, where the wealth fuels eccentricity. Now, it may look an acceptable outburst of show off, but at the time it might have been look revolutionary and out of normality. However, it is hard to imagine the normality of those times. It seems that Mr. Roselius was not only interested to invested in a museum aimed to present the history of the trade in the Hanseatic city of Bremen - here one can admire the foundation document of one of the first international trade association of the world, 'The Company of the Black Heads of Riga' - but has some literary passions as well. 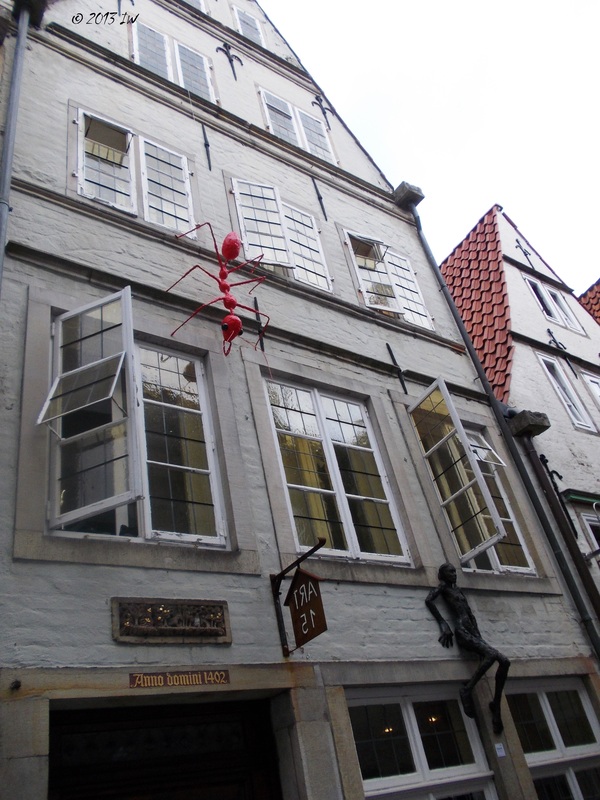 As the father of the literary character Robinson Crusoe, by Daniel Defoe, was originally from Bremen, the coffee magnate invested into the construction of a Robinson Crusoe house in the area, nowadays hosting an elegant hotel. Böttcherstraße is also sought after for the 'Glockenspiel', a construction of 30 bells made of Meissen porcelain whose harmonies accompanied my last minutes in the Roselius Museum. The chiming time varies during the seasons and the day and the melodies are inspired from the life of the sailors and the music of the oceans. 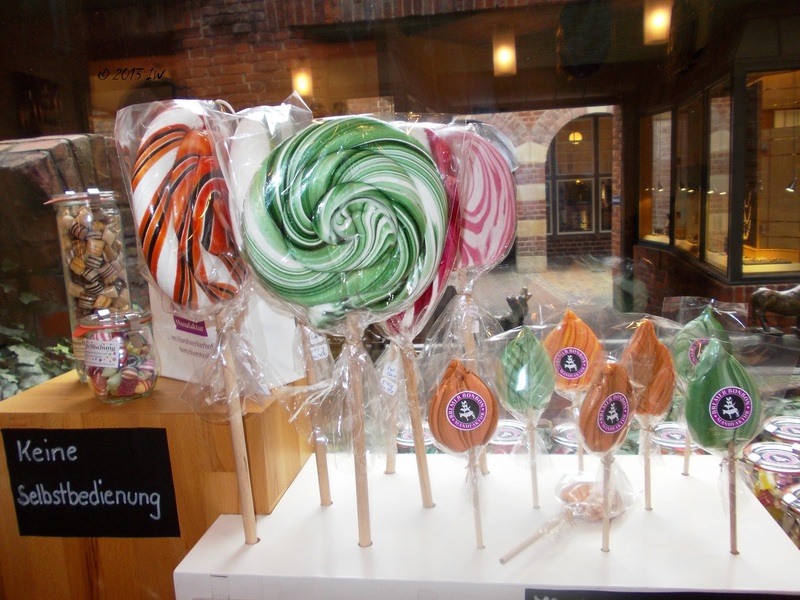 I ended up my visit here with a stop at a candy shop close to the museum area, where the colourful sweets were made under my curious eyes. I did not have too much time to learn the recipes. I headed immediately to another appealing area that winked at me during my mini-tour. Schnoor Quarter is an old lady easily wearing in her own way the costumes of the new world. Many houses in the area were first built in the 15th century. They are small and suit big families with small trade businesses. Nowadays, they host vintage and home design shops, restaurants or coffees. Only the small streets remember of the crowded times of the past. I dared to enter the colourful Galerie 37, where a lot of interesting small works of art are waiting for new owners. Some of them are signed by Matisse, Max Liebermann, Niki de St. Phalle, Aristide Maillot or Oskar Kokoschka and can be purchased for less than 3,000 €. After another small walk on the streets, I hurried up (again) to my next destination on my to-do-list: Kunsthalle, the museum of art. At the ground floor, preparations were made for the opening of a new exhibition. Out of many permanent and temporary exhibition available at the time, I decided to limit my artistic appetite to some Romantic authors and paintings by travellers artists. The beautiful nature of Italy, France or Greece were the all time inspiration for artists across centuries and continue to be so, even in the post-postmodern stage of the history of arts. Beauty always resists the test of time. 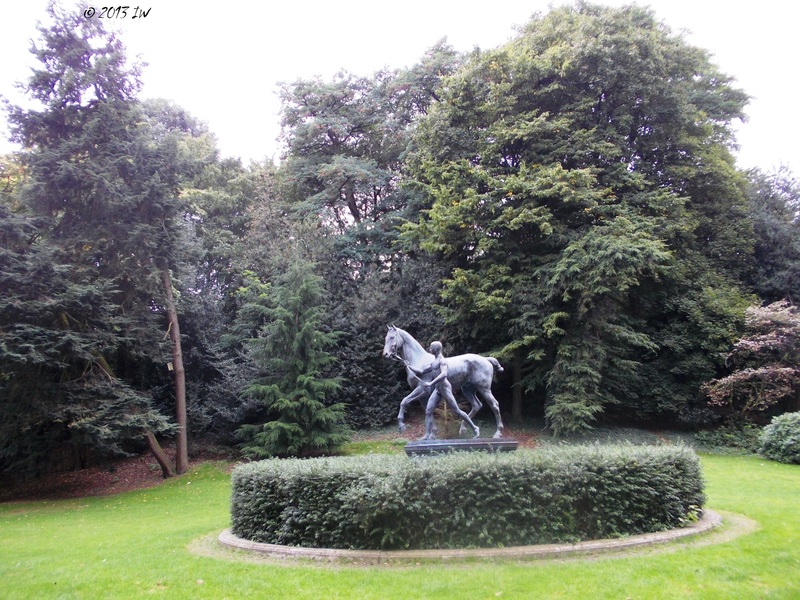 I used the next two and last hours of my trip to Bremen for another tour of the center, a short trip in the Bürgerpark and a coffee. Earlier in the day, I visited the Chocolaterie Hachez shop Am Markt, but there were no tables for a proper chocolate tasting despite the persistent and obsessive sweet smell inviting you to stay more and eventually have some tasting. I had the chocolate in another historical coffee, at Stecker founded in 1908, with a pavement made of blue and white tiles and old elegant couples sipping their afternoon coffee. I was thinking that with a long bus trip back for the next hours I will have enough time to relax after and instead of adopting a carefree attitude studying the menu, I should gulp my coffee and run to see the Übersee-Museum, featuring art from non-European cultures. But I immediately found the excuse of keeping the museum for a next visit. I don't see any reason why I should not do it in the near future, once my project 100 Places to See in Germany is done. This trip was kindly supported by MeinFernbus, but the opinions are, as usual, my own.